The Plakart Association of Graphic Designers has announced and opened its 9th International Student Poster Competition (ISPC) on the theme “Identity in Crisis“. This year the organizers are putting an emphasis on the issue of the identity, which in the face of the world’s events is vigilant and essential topic. ISPC, Skopje 2016 will award two equal prizes to two poster winners. Both winners will be invited to be part of the jury for the next edition of ISPC, will exhibit at the Museum of City of Skopje during the Skopje Poster Festival 2017 and will receive an ICOGRADA certificate. “Identity in Crisis” represents a base of cultural interchange, having made new friendships, realizing the importance of tolerance as its major goals. Through ideas based on tolerance the young spirit should understand its value and realize the common advantages that this concept offers, building a solid grounds for further promotion of tolerance on global grounds. All students on Bachelor, Master and Doctor studies of Fine arts, Design, Visual arts, are invited to enter the competition with a total of 3 poster designs. This year the International Student Poster Competition is supported by Ministry of Culture of Republic of Macedonia. 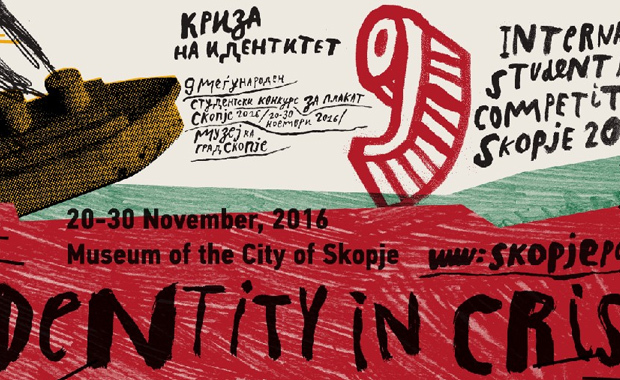 City of Skopje and in collaboration with Museum of the City of Skopje.